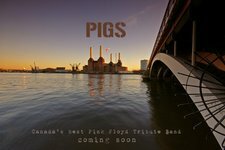 Formed in 2008 in Victoria, British Columbia, Pigs have been amazing audiences ever since with their dynamic re-creation of one of the world's favourite rock groups. Pigs' claim to fame is their authenticity, which means looking, sounding and feeling like the real Pink Floyd in their hey-day: the '70s. Audiences can expect long, pyschedelic jams to such songs as 'Shine on You Crazy Diamond' and 'Set the Controls for the Heart of the Sun' as well as impassioned performances of emotional material like 'Comfortably Numb' and 'Us and Them'. Audiences lose themselves in the band's lights and visuals, which give the music an otherworldly feel. Pigs has seven members and include a backup singer and saxophone in most performances. With the passing of Richard Wright in 2008, fans of Pink Floyd lost hope of ever again seeing their favourite band re-united. Pigs offers the next best thing: an authentic look back into the breathtaking past of one of the world's most timeless bands.